I love this grave of the soldier Jean Nicholas Fauquenot who was killed near here on 25th September 1918. 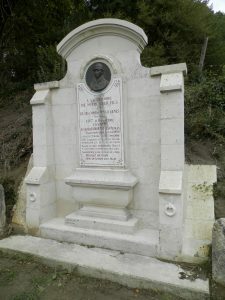 The grave is outside the village of Allemant beside a grassy track that leads up out of the valley. To the memory of our dear son and his companions in arms. Joined voluntarily the Class of 1920, courageous and committed. 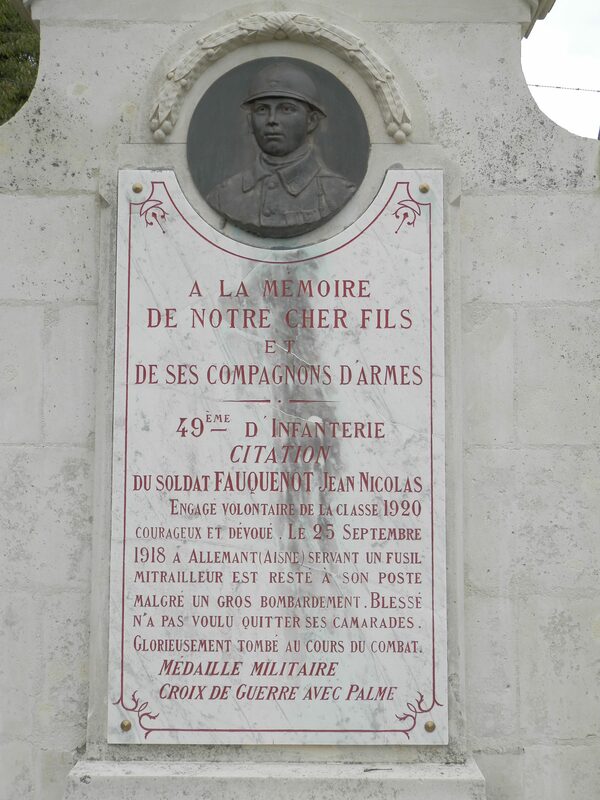 On 25 September 1918 at Allemant (Aisne) crewing a machine-gun stayed at his post, despite heavy bombardment and though wounded, would not desert his friends. Gloriously fallen in the heat of battle. There are many such grave monuments across the Western Front, so why should I pick out this one? 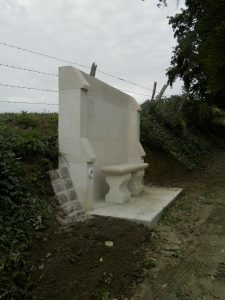 Apart from a desire to commemorate the soldier, I am fascinated by the condition of the grave and that within the last few years, another matching structure has been installed on the other side of the grassy path. It is not just a bench, it is a monument. The parents of this soldier have long since gone to join him. He is not likely to have surviving siblings and I doubt that he had fathered any children of his own. Yet, someone has thought fit to invest in a lovely monument to complement his grave so that visitors may sit in some style to admire the man. With such dedication to a ‘soldat simple’, why should I not make a small contribution to commemorating his valour and memory? I salute you soldat Fauquenot! This entry was posted in Uncategorized by Robin Goldsmith. Bookmark the permalink. I like this article, thanks for posting!